Kauai is the fabulously beautiful Hawaiian island that is known to a number of travelers under the unofficial name ‘The Garden Isle.’ The island was formed by volcanic activity. According to scientists, its age is about 6 million years. Kauai is one of the oldest islands in the world; its main attractions are unique natural objects, which will be interesting to all travelers. The starting point for many excursions is Alakai natural reserve, a considerable part of which is occupied by vast rainforests. It’s not easy to enter the territory of the reserve, because roads there often turn into rapid mudslides due to abundant rains. Those who manage to get to the reserve would experience unforgettable impressions. Rising to the top of Waialeale with a nature reserve on its slope, you can literally walk through the clouds. There is a magnificent observation deck on top of the mountain. There is another interesting sight, Fern Grotto , to the east of the island. This grotto, as well as many others, was formed of lava; it’s completely covered with dense thickets of ferns. It resembles an incredibly beautiful and solemn arch; this grotto is a must see place of all excursions. There are also some interesting architectural sites on the island, including the charming Iraivan Temple. Its construction has begun only a few years ago. The temple dedicated to Lord Shiva is made of rare white granite that was brought to the island from India. It’s noteworthy that Iraivan temple is the only religious building in the United States, which is made entirely of stone. Hikers to historical sites are recommended to visit Haena Park situated to the north of the island. There you can see the oldest island structures in the park; the ruins of buildings are of 2,000 years old. These scenic places aren’t deprived of natural attractions. After seeing the ruins of the historic structures, it’s certainly worth to stroll along the local grottos and caves, which were formed by volcanic eruption more than 4,000 years ago. Allerton Garden is the best fit for acquaintance with local flora. It’s located in the southern part of the island and occupies a vast territory making out more than 300 thousand square kilometers. Exotic plants and flowers strike with their beauty; this wonderful piece of nature is home to rare species of animals and birds. The most visited cultural center is Kauai Museum situated in Lihue. Here you can find a rich collection of historical artifacts dating back to various ages. A part of the museum is devoted to the culture and life of indigenous population. Walk around the town of Hanapepe will give lots of impressions. Its picturesque streets are continuous series of interesting art galleries, souvenir shops and craft workshops, some of which resemble real museums. One of the favorite pastimes of Hanapepe guests is walking along suspended bridges passing over the river; fans of thrills would enjoy it. The amazing Garden Island is ready to offer a lot of prospects for an exciting holiday. Kauai is widely recognized as one of the main eco-tourism centers in the world. Despite active development of the tourist infrastructure, which has become particularly active in recent years, the island has remained a clean place that fits even strictest ecological standards. Dense tropical forests cover a significant part of its territory. In these forests, visitors have an opportunity to see many endemic plants, rare insects, and birds. Kauai is often referred to as “the island of golf”. As it is not hard to guess, there are several excellent golf clubs on the island. Best professionals in the world worked over the creation of local golf centers, so it is safe to call them true masterpieces of landscape art. The island is ideal for sport and active recreation. 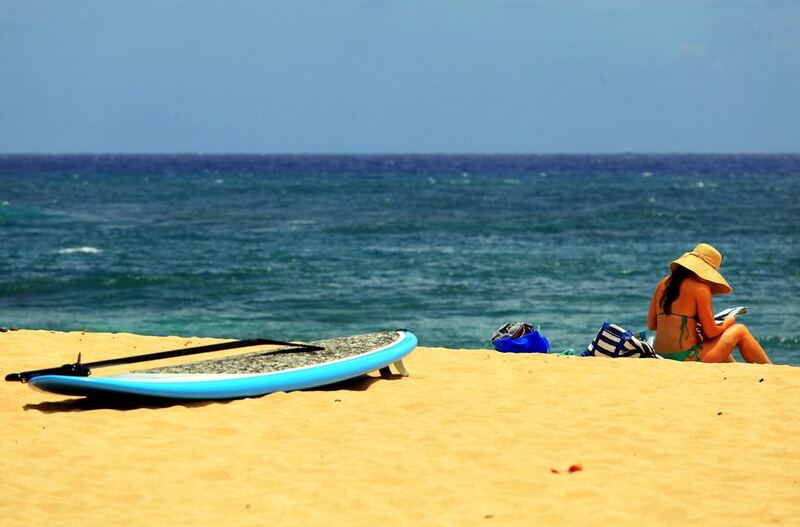 Every year, numerous fans of surfing visit Kauai. Many of them visit Hanalei, the settlement that is located in the northern part of the island. This resort has beaches that are ideal for surfers of a different level. The southern part of the island is perfectly suitable for trouble-free relaxation. This is also the location of Mahaulepu Beach – the charming beach has an important landmark nearby. In this part of the island, tourists can visit unique caves that still have ancient petroglyphs. As it is not hard to guess, the caves are a very popular tourist destination. 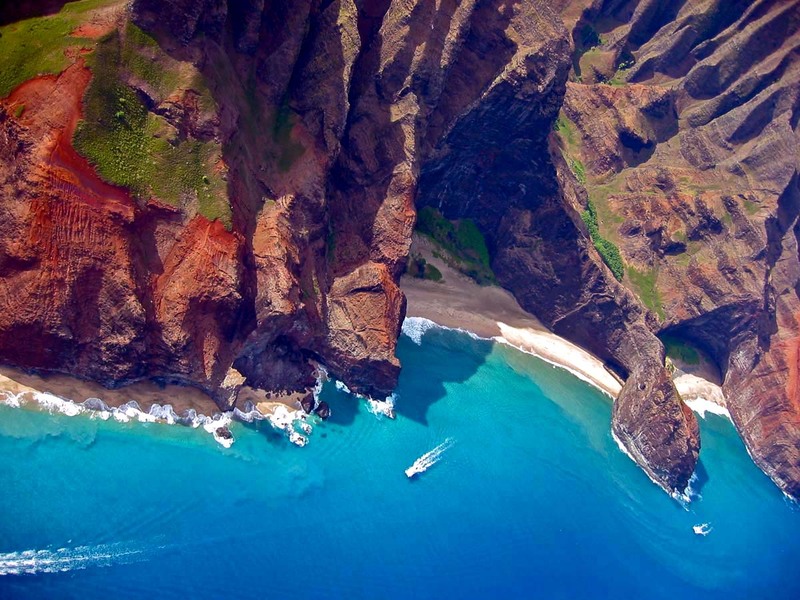 This guide to iconic landmarks and sights of Kauai Island is protected by the copyright law. You can re-publish this content with mandatory attribution: direct and active hyperlink to www.orangesmile.com. Check on the map: Distance from Kauai Island center - 30.9 km. All about Kauai Island, USA - sightseeings, attractions, touristic spots, architecture, history, culture and cuisine. Prepare your trip together with OrangeSmile.com - find out the 'must see' things in Kauai Island, which places to visit, which excursions to take, where the breathtaking views are waiting for you. Planning your trip with this travel guide will help your to get the most out of Kauai Island in few days.